I selected my daughter's name years before I gave birth to her, one Ramadan Day. Her name is mentioned twice in the Fatiha, the opening verse of the Quran. It literally means "path" and it symbolizes the right choices and decisions and actions that we take in life. I always tell her it is a unique name, one that nobody else has and that it is up to her to make it worthy of name sake. The doctor seemed alarmed when he told me the baby needed an emergency c-section, perhaps because he knew I was always keen on a natural birth. I then looked at my husband and pleaded for the name Syraat if it was a girl, which was an unusual name for him. We didn't know the gender of the child till the doctor at the Geneva clinic proclaimed: "it's a girl!". Soon later, my father was distributing dates as she was born right before "iftar",the breaking the fast dinner during the month of Ramadan. Six years later the house is full with her fiesty attitude. She wakes up with and maintains her eyebrows in an upside down V. (We call it a Farsi 8). Those eyebrows settle in the company of teachers and coaches. When she walks into class, or at ballet or aikido or riding, her eyes, the color of black olives, soften and she smiles at her instructors. They all appreciate her eagerness and focus. No sooner does she leave her classroom or jump off of her poney that her eyebrows rise again, and she begins her lamenting. When back from school, even before lunch, she darts to her room where she draws. Her style is akin toNiki de Saint Phalle's, with minute colored details and motifs of stars, hearts and butterflies. She creates a feminine world for us at home with imported glitters, stickers, accessories, arts and crafts. She stands between being feminine and a tomboy. She has decided to host her girlfriends who would refuse to touch a soccer ball at a ballet birthday and then will co-celebrate with her brother at a soccer party when she will invite her boyfriends. She does indoor climbing without fear and uses her agility to her advantage. She is turning 6 today and I have enjoyed each and every moment with her. I do wonder about her development as a teenager. Of my three children, she is the one with her own mind and her determination. Her aunt and uncles have predicted a "goth" or bohemian style in the future! Her favorite character is the Manga girl, Sakura. Naruto's best friend. It was the summer of 1985. I was 14. Madonna starred as herself in a movie called "Desperately Seeking Susan" with Rosanna Arquette as Susan. One of the most memorable scenes from the movie is Madonna changing in the public bathroom and drying her under arms under the hand drier. She was thirty years old at the time, with heavy eye liner, a perm and a mesh black top revealing her bra. Indeed, it was Madonna who made visible bra straps fashionable. Right around the same time, I discovered a store on M Street in Georgetown, Washington DC that was called Up Against The Wall. It had all the neo-punk accessories that appear tame today in comparison to piercing and tattoo fashion current teens wear. I bought fluorescent green, yellow and black rubber bangles to wear by the dozen on each arm and I tied a black lace ribbon in my permed hair. I wore pink jeans with black paint spots on them. My parents turned a blind eye to my fashion statements, even to my nails polished or should I say painted, in different shades of neon pink, orange, yellow and pink. I made my entrance at a preppy boarding school in Geneva thus clad, emrbacing my desire to be set apart, to have my own style and opinions. I remember seeing "Desperately Seeking Susan" seven times. In the pre-DVD era, we had to go to the movies to see a film that many times. I cannot remember how I managed to do that considering I had watched the Maverick Tom Cruise in Top Gun perhaps 3 times as well. Madonna was not a good actress. Even I knew that a year later from seeing "Shanghai Surprise" in which she starred with her then husband, Sean Penn. But in "Desperately Seeking Susan", she acted as herself, chewing gum and dancing wild to Get Into the Groove. My siblings and parents tease me. They say I have retained those dance moves since 1985. All the teasing has led me to hate Eighties music and fashion. But when it comes to dancing, I can party all night, as long as the music is good. I have been spotted in the Maldives, in Istanbul and in Beyrouth! So listen to this and get into the groove!!! I received an article from the Economist by email. It was supposed to alarm me, frighten me, make me withdraw my children from the French school and drop them happily in any other, preferably Anglo Saxon, school. However, it did not alarm me in the least. Yet, I didn't know that it was as a result of the debates after the publication of a book by a British journalist/professor, Peter Gumbel, who lives in France and had sent his children to a French school. "On acheve bien les ecoliers" staunchly criticizes the French system for many reasons amongst which the most important accusation: the way the students are harshly graded. I have read extracts of the book and I cannot disagree with its facts. The same applied to the article in the Economist. "So?" All the points made are correct and I will not reconsider our educational choice based on points that are considered to be drawbacks by some, and not by myself. My youngest had a very strict nursery teacher last year. I liked her and I think all her students, my son included, liked her too. She did frown a lot to get her message across. She did speak with her index lifted in a reprimand. My son considered her to be a challenge and not as an obstacle to his happiness. They would lock horns. He would frown back at her and would look her straight in the eyes. I can state now, with enough hindsight, that her strictness helped build his character. I don't remember disliking any of my teachers because they were strict, or because they graded us with parcimony and never flattered our egos with star shaped stickers. I had to look "Awesome" up in the dictionary and still don't know a French translation for it. I know the antonym of "Awesome" in French and that is "Nul", a word that the British journalist often refers to himself. I don't know how to translate the word "Nul" in English, Anglo Saxons never use it to describe any student's work. Indeed, the French teachers count mistakes rather than count correct answers. They deduct points rather than add points. I was used to that. I often got a catastrophic grade in spelling but that has made my French spelling today flawless. We can handle those grades. We get accustomed to them. But we learn from the mistakes that the instructors circle in red. "Travail bacle". Most French students have received such a remark. It means that the work has been done in a hurry, without care. Such a remark, rarely mentioned in the Anglo Saxon system, requests that the student do his work with diligence and respect. There is a certain notion of perfection. The French system maintains a formality that is a requirement for discipline and hard work. Teachers are not lax. They demand rigor. The work load is heavy and the expectations are set high. I was not nervous when I changed systems at the higher education level. I could meet the challenges of the American universities because I had been under such pressure in school. Bad grades in college, which to be honest were few and far between, did not phase me. I learned from my mistakes. I am one who has tried the American high school system in summer school. Certainly the summer programs must be lighter and less rigorous than the academic year, but I thought of the atmosphere as less competitive and less challenging. I admire the academic nature of the French system. I agree that children should be introduced to complicated subjects such as calculus, statistics, philosophy, economics and more recently international relations at the high school level. I also believe children can be introduced to geometry and geography as early as grade 3. Moreover, at a very early age, two foreign languages are introduced to the child, giving him an opening to different cultures and idioms. Teachers have systematically summoned me in the past about my older son. They say that he "is too much", that there is no room for his personality in the classroom, that he has to change to accommodate his classmates. These remarks about "cookie cutting" my child have not broken his confidence or personality. They have just toned him down by one crank. Just today the eldest told me "I love my school". But in the back seat, my youngest replied: "I don't like school. I don't want to learn." Of course he said that in classical Arabic, making a "we don't need no education!" type of declaration. On October 24, 2010, Mahmoud Said's "Whirling Dervish" sold for an incredible 2 million dollars at the Christie's Dubai auction. In the nineties, I used to follow the stock market, and invested some cash in Starbucks shares. I would always grab the financial pages of the Boston Globe, while sipping a capuccino at Starbucks and look up my favorite stocks. I predicted Abercrombie and Fitch would do very well. We also invested in Millennium Pharmaceuticals because one of our friends who worked there, vouched for the company. Auctions in Dubai for Middle Eastern art reminds me of trading floors. Trigger happy individuals brandish their paddles, and telephone bidders are fiercely competitive. I confess that I often hold a paddle myself but I am always looking for bargains, hoping to buy a piece for under the asking price. I once was very fortunate to be the only bidder on a Ghada Amr piece and realized that this famed Arab New Yorker wasn't appreciated yet in Dubai and the region. The principal auctioneer at Christie's Dubai is very talented at what he does. By now, almost a dozen auctions behind me, I have grown accustomed to his mannerisms, his body language and distinguished British accent. He stands like an orchestra conductor, hammer in hand, and his cadence, tempo and perfectly studied pauses combine to raise the prices to triple value (or more). I particularly appreciate his "fair warning", meaning in simple terms: "this is your last chance guys!". The Christie's art auctions in Dubai may be a stage for us to watch speculation at an extravagant level, but they are first and foremost very rich cultural experiences. The previews that are so beautifully curated at the Emirates Towers are rare occasions for us to view and especially get better acquainted with Middle Eastern art. I have learned so much throughout these events and have always had the assistance of experts to explain and answer any question, something I rarely find in a museum. In museums, I am always keeping an eye out for pieces that are on loan from private collections because I believe I will never see them again, as they will comfortably be hung in the living rooms of the privileged. I think auctions are similar: many of these paintings and sculptures are exiting from living rooms (and diverse artist studios or galleries) and most of them are entering the privacy of new collections. Here is the rare opportunity to view them before they are traded! On my last trip to Instanbul, I went in search of contemporary art. The art galleries are so far flung from one another, with strange closing hours, and when we did battle traffic and found them, the temporary exhibits were often disapointing, featuring only one artist. This made me think how different my art appreciation experience is in Dubai, thanks to the efforts made by William Laurie and Hala Khayat, who build a beautiful collection every season! William Laurie has left Christie's and will venture into other art activities and I wish him all the best! He has taught me a wealth of knowledge on Middle Eastern art and I am very grateful. When I met her for the first time for lunch, it seemed like Hayv Kehraman has stepped out of one of her paintings. Her art is about herself, her past, her training and education, her vision and ideas. Her background is reflected in her art: a mixture of East (Iraq) and West (Sweden and the USA). For a long time, I have been fascinated by the preciousness of the details and the richness of the materials she uses in her work. 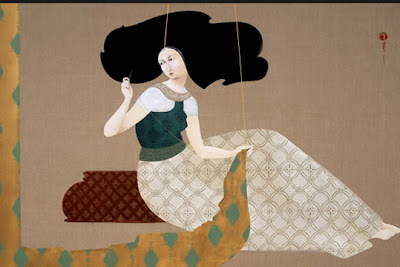 She paints on canvas, a rich natural beige color linen. She also has selected wood, always a very fine wood because she paints what appears to be a very fine veneer of oil and the wood appears in all its beauty and veins in the unpainted areas. Like pre-Renaissance frescos, there is no perspective or background in her art. Only the women in their two dimensionality, reclined and often occupied grooming themselves. Almost always, the women, single or multiplied, quasi prototypes of each other, wearing various motifs on their flamboyant drapes. The precious materials and the details in the attire remind me of Renaissance women. But these women all have jet black hair and turkic features. The painting technique can seem "japonisant", and the subjects resemble Persian miniatures. However, the closer you look at the women's accessories, the more they look modern. 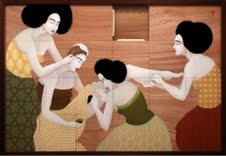 In her latest show, "Pins and Needles", at the Third Line gallery in Dubai, (which represents Hayv Kahraman), there is a a series of beautiful oils, representing women at play. Each painting reflects a single game, ones we still play today. Take the portrait of a woman with interlinked elastics, her fingers intertwined in them. She is all facial expression. 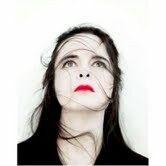 A Middle Eastern version of Amelie Nothomb, a startled look on her face. I had the opportunity to share that analogy with the artist. She smiled in surprise as she didn't know the Belgian writer. Another canvas has a small number of women playing sticks and needles. I was surprised that this very Western game was being played by women in traditional Eastern looking garb. The painter had painted elements of her own Western childhood and I appreciated the autobiographical note. My favorite piece was an enormous painting on "wood puzzle". This piece is composed of wooden square panels that can slide, because there is a panel that is removed, allowing the other ones to be scrambled. However the painting, seen intact, is an assembly of women, performing very intimate gestures of grooming. 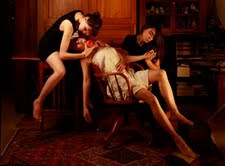 The female intimacy and communion reminded me thematically and in composition to Nazif Topçuoğlu, whose photograph you can see below. 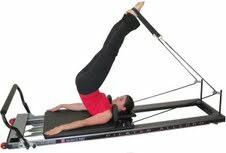 "You have to work on your transitions to make it to the next level," the pilates instructor has often told me. Not only do I need to be well acquainted with the exercises, but I also have to be able to go from one exercise to another with ease, to edit all the unnecessary gestures and facial expressions and transition gracefully between all the pieces of equipment, before getting to the next step. I found myself thinking about graceful transitions today, as my son came out of the pool, an amazing hour of squad behind him. He was proud of his swimming results and good time he made, but he was slacking off now, slowly drying himself and chatting. I am a busy "swimming mom". It is important for him to realize that I have to go home to the rest of the family, and he himself has a science exam to prepare for! People who judge me as strict or too disciplined have not seen me interacting with my children. I am often fullfiling their whims, playing their music, finding their small quirky toy accessories. It's not just about swimming, playing the violin, and studying continuously. There are many playdates I organize, birthdays they attend, indulgent sleepovers at their grandparents, cousins to see and many park or beach days. There are also moments when mama takes a break, whether for an art event, a party, or a manicure at N Bar. "Quand le chat est parti, les souris dansent!" (When the cat is away, the mice dance). Those are moments made for my kids to break the rules, switch the Play Station on, and load up on DVDs, hands in the cookie jar! Time management is a true philosophy. My kids, especially the older ones, should learn to transition from one activity to another. To use another Club Stretch imagery: "if you go right into savasana mode, you will maximize the rest time". I would love my kids to learn this: if they don't waste time, they will have more time to play! Some grew up with Richard Scary, others with Nod Nod, or Dr Seuss. My children all love Martine but they especially identify themselves with Franklin the Turtle. It all started with a birthday gift my son received when he was three or four years old: a whole collection of Franklin books. I must confess that it was a "non return without receipt" policy that encouraged us to keep the books as I, the story reader, had never seen the turtle book and I wondered about reading a book in translation to my children. It turns out that Franklin is written by a French Canadian author, Paulette Bourgois and illustrated by Brenda Clarke another Canadian. What I enjoyed most are the cute narratives of a child's daily activities. The personality development is done to perfection. We know Franklin very well by now and the various stories are consistent in character portrayals. Not just Franklin but his friends Martin the Bear, Lili the Beaver, Arnold the Snail, Jack the Rabbit, Beatrice the Goose, the Owl teacher and Franklin's parents. The community around Franklin is almost as diverse as the Simpsons! It always starts with what Franklin knows: he can tie his laces, or he can count two by two, or he can recite the months of the year. Then, at page 2, the adventure begins. Franklin is buying a new bike helmet, or he is being overwhelming to his friends, or is on a mission to finish a house task, or he wants a sibling, has an operation, becomes a boy scout, has a new babysitter, celebrates Valentine's day or is afraid of storms. In this decade, when children have all become "little emperors" and their upbringing is based on communication with the parent rather than authority the way it was with children in the Seventies, Franklin embodies all the quirks kids get as a result of this open communication policy. 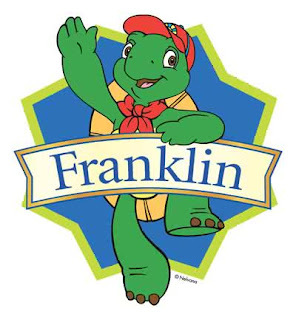 In fact, my older brother couldn't help noticing that Franklin is always moaning. I couldn't disagree with him but at the end of each story, he straightens out, admits to be wrong, says he is sorry, is reminded to respect others and not to be materialistic. There are many open messages and a good morality to every story. I can often tell my kids: well, Franklin reacted the same way as you, but he realized that he was wrong and he corrected his behavior. In the end, the Franklin stories do help with communicative upbringing. It is good to have a falliable role model. My children gladly identify themselves with Franklin. 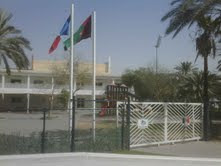 I thought Jebel Ali Hotel and Golf Resort would be closer. After all, twenty years ago, it was our festive friday destination or an afternoon drive with our Teta, our paternal grandmother. 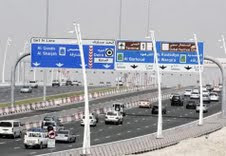 We drove on the Abu Dhabi Road (now called Sheikh Zayed Road), which had two lanes on either side and we eventually would veer on a perpendicular road that led us straight to Jebel Ali Hotel. We would pass desert dunes and would spot camels. We always noticed the chimneys of Dubal Industrial Zone and then, past the "jebel" which is but a hill with a satellite dish. We would peer with excitement in search of the palace or the great big white boat, which was really the massive hotel. It was the Saleh and Baqr families who had the vision of this resort, in the middle of the nowhere, on the beach. The edifice blended in the horizon and its marble halls appeared like a mirage in the desert. The gardens were flamboyantly green with dashes of bougainvillias. My grandmother loved the place and the trip was always considered worthwhile. Today I drove the distance with my son because I had heard that the big 9 holes course was well priced and that the grounds were pretty. My expectations were not too high as I had been disappointed by the Arabian Ranches golf club and also to a certain degree by the Festival City golf club with its prohibitive green fees. The service at the Jebel Ali Golf Club is nothing less than perfect. The staff is friendly, serviceable and kind. As background information, my ten year old son is a much better player than I am. Both of us began playing large courses last year only and I still get the expected nervousness at the beginning of the game. Many believe that golf isn't a dynamic sport. They should try playing two hours like we did today or four hours had we chosen to play 18 holes. Granted we drive a buggy but I have walked for 9 holes once and it was very enjoyable. I think that if and when my game improves, I would resort to walking, as I would make it to the green in fewer shots! The mental focus during these long stretches of time is incredible. We are always considering the various variables and making decisions based on those variables. The other half of the game is retaining the technique! Just this morning I had practiced my swing as well as my chipping and that did not prevent all the unwanted errors today. 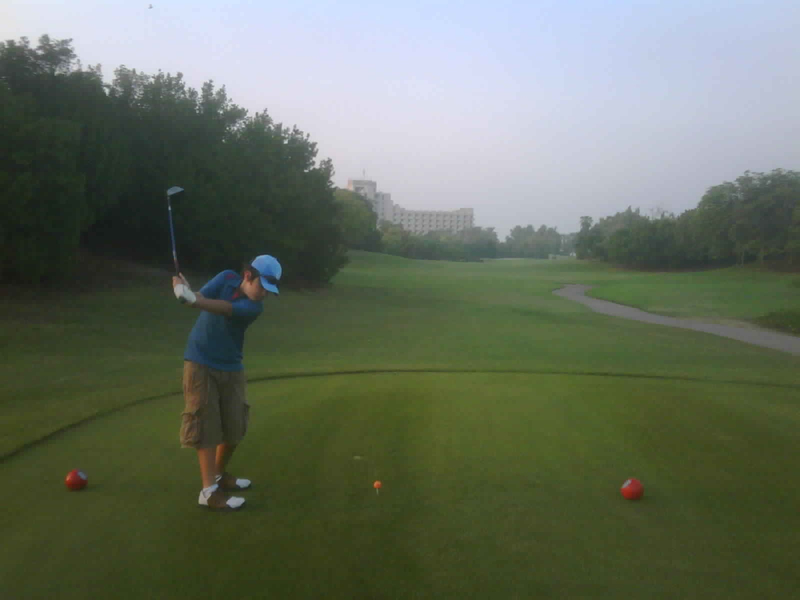 The first hole at Jebel Ali is a long intimidating one. The last one is equivalent but I played it with half the amount of points. I began the game, grunting and making one mistake after the other. But then my muscles warmed up and I was playing without thinking too much. My son coached me: "just chip mama, a normal one, stop thinking about how to chip." The manicured lawns, the beautiful landscaping, the wandering "trademark" peacocks, the green hills and variety of palms, the small lakes and intimidating bunkers and always the landmark hotel, reminding me where I was, somewhere in my past, considering this was a visit to a place long time not seen. I passed a free standing gate on the green that seemed abandoned and a sign explained: old gate house. A rush of nostalgia hit me. I remembered my Teta and her predilection for Jebel Ali Hotel. I also thought of the Saleh and Baqr vision being so clear at the time. Thirty years later, Abu Dhabi and Dubai have become two integrated communities, a quasi megalopolis and Jebel Ali Hotel and Golf Resort stands in the middle, servicing a huge influx of tourists! Like an Oasis or Wadi. If I were to present my teaching credentials, I only have tutoring as an experience. Perhaps I was born in a wrong century. I would have been Jane Eyre! I have always tutored one child at a time, either one of my three siblings or one of my three children. My husband has been my victim as well, since I did teach him the little French he speaks today. He thought of getting a French teacher. I thought he was crazy since he was married to one. The same applies to my children. Why would I get extra help for maths or history when I know all the ins and outs of the French education and have been tutoring it for so many years? Fortunately there was only a gap of a few years when I stopped tutoring the youngest sibling and began tutoring my eldest son. My phone rang during one of those tutoring sessions and my friend asked: "are you still teaching him? Haven't you given up at grade 7?" I felt guilty for a second but then shrugged the guilt away. My kids benefit from the spoon feeding. I think good schools are supposed to spoon feed knowledge and if you happen to be in a larger more challenging school environment, why not assist your children so that they have the learning tools to take with them to class. I certainly am not there at exam times and they have to fend for themselves but why not prep them for the exam? Isn't studying about learning? What I have discovered, with my three kids, is that I have to take them each from a different angle. 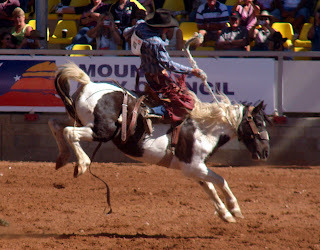 The best metaphor is horse riding. When my kids head to the stables, they have their preferences for this or that horse because this horse will stall or that horse is too rapid or the other one will take you on a rodeo ride. My three kids are like horses. One is very stobborn and will argue and nag till she is seated and willing to listen. Then she will concentrate fully. The other will divert my attention as much as possible so as to waste time but will know deep down that he is better with my tutorial than without. The third will eagerly sit and will consider tutoring time as quality mommy time. I thought I had taught kindergarten twice before, but the third time is as different as the second time was. This year, I have a child in junior high, another learning to read write and calculate in second grade and the third learning to master penmanship in kindergarten. My method is to teach step by step, repetitevely and regularily. The more you read, the more exercises you solve, the more information you learn. I try to keep the subjects interesting and non intimidating. I always tell my son: don't let the mathematics scare you, examine it one step at a time. 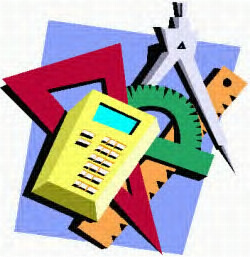 Maths are very systematic as all reasoning should be. When you have to be creative in other subjects, let go of your inhibitions and think out of the box. I think I am a good swimmer but wasn't able to teach any of my kids swimming. I have always found swim coaches for my children. By analogy, I therefore understand intellectual parents who are unable to explain or teach academics to their kids. Luckily, I am also their driver and their golf partner, and a soccer/swim/judo/ballet mother, so I believe I am present enough to even jot in a few tutorial revisions in the summer....I wonder what my kids will blog about me? Nathalie was promoting the Ben Affleck movie the Town on Dubai 92FM. Boston happens to be her town too. I enjoyed watching the movie. I love Ben Affleck and Boston is a very photogenic city. The movie isn't about Boston itself. It is filmed in Charlestown, a neighboring suburb. I knew Charlestown well, as it is a 5 min drive away from Boston, but perhaps not well enough to recognize every street corner. Charlestown has been mentioned in this blog, in Chefs in the Family, when I compared my brothers' cooking to Todd English's. It was English who drew me to Charlestown with his Olive's and Figs restaurants. I never thought it was a bad neighborhood. In fact it has been gentrified. It didn't have a Starbucks when I was there, nor a GAP but it was a nice residential neighborhood in many areas and perhaps the projects that are mentioned in the movie are further down. The movie was all about Ben Affleck with his really worked out body and his good acting. He played the part of a likable anti-hero, a bank robber. There were a lot of car chases and a lot of adrenaline rush. It makes for an entertaining movie. As the robbers crossed the bridge to Boston, I looked for the familiar streets and my heart would squeeze. 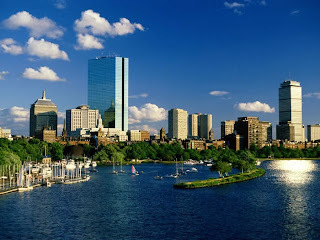 My beloved Boston! I lived there for 9 years without counting my various weekend escapades there while at Smith. My memories are blurry and happy and I have always alluded to them on this blog. I do have one regret though and if ever my kids study there I would make them this added recommendation: to go watch the Red Sox! I never did and the movie had a pre-game scene which caused these regrets. No other regrets though. I knew my city inside out and I certainly appreciated and noticed its beauty while I lived there. As I was driving on Sheikh Zayed Road with my brood, gazing at the forest of high rise buildings on both sides, listening to a tune on the radio that I had circuit trained on, I was reminded about how dynamic our city Dubai is. Take my ten year old son who swims for squad at Hamilton Aquatics. They also train the Serbian 17 year old champion, Velimir Stjepanovic. Just the other day, he swam in the same pool as my son, a few lanes away. He was literally flying in butterfly above the water. He is the fastest fly and free style swimmer of his age in the world and his records are better than even Michael Phelps' were at his age. He studies and trains in Dubai. He is coached by British, South Africans and Australians, together with a couple of Olympic team candidates. Dubai attracts the best sports instructors. When we play golf at the Creek Club Academy, we are coached by Scottish professionals. We have learned to decipher their accent while chipping and putting. Besides swimming and golf which are his favorite sports, my son has been practicing judo for 5 years now, at the Dubai Karate Center (where I trained in Karate in the 80s). Sense Yoneda is Japanese, with a 6 black dan and he instills the sense of discipline and concentration. In this blog I have often mentioned my American pilates and Bikram yoga instructor at Club Stretch who has modified my posture, has taught me how to focus and how to integrate the art of pilates in my daily life. Bikram Yoga is the only yoga that appeals to me. It has taught me to relax at the right moment and I have taken that adage to heart. Additionally, I have been taught to "edit out" all the small habits that interfere with my relaxation and concentration. Zen is really what I achieve. My children ride with English or French riding instructors and they have been rock climbing with a Nepalese climber for a few years. My daughter dances ballet at the Ballet Center and she follows the Royal Ballet exams from England. They play soccer with British trainers. I will not omit the Pakistani squash instructor of the eldest or the Sri Lankan Aikido Sanse who coaches my daughter. My 5 year old's gentle and measured preparation into a Japanese seated position tells of the time and patience given by the skilled instructor. I mention all these nationalities to explain how all these sportsmen and women from all over the world have come to Dubai to train. We are very fortunate to benefit from this dynamic community and have certainly only tapped on the surface of these resources as we are recreational sports lovers. We randomly take skating and ski lessons, only admire the polo players, the endurance horse racing and the kitesurfers. We do not dive and my daughter will try to brake the jinks of us being below average tennis players. These talented sportsmen and women that coach us infuse our lives with vitality and health and we are very much grateful. 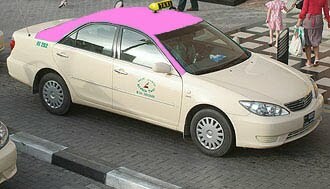 They make Dubai an attractive city because it has a very sportive lifestyle to offer. My father closed the door while bidding me farewell and suggested a "Amr Diab!" That could inspire me, he offered. I often complain about my lacking inspiration, ready to call for a halt, or at least a respite on this blog. It has been five days since the paternal suggestion and today, at the perfect moment when I was leading a desperate housewife activity which consists of sorting the groceries into meats, veggies and dairy bags at Carrefour, the happy tune came on. Amr Diab made me smile at ten am, at the supermarket, before my pilates class. Amr Diab is a VERY charming wedding singer turned pop star, or perhaps he is a pop star turned wedding singer. I believe he is the one who turned Arabic music into pop, removing it from the languorous melodies of Fairouz or the melancholic tunes of Um Kilthoum. He stole some Gypsy King stanzas (there even was a court case) and transformed Arabic music into lounge music. ..... An Afghan prince charming serenaded me in front of an elevator at the Fletcher School of Law and Diplomacy. What impressed me more than his guts to sing an Arabic song, he the non Arab, to a girl he knew was an Arab but had not been introduced to, was that he had selected the appropriate singer. Five years later, that Amr Diab song, along with Go West by Pet Shop Boys became our theme wedding song. We couldn't afford to invite Amr Diab, all clad in Versace silk shirts to sing at our wedding, so we looked for him on his American concert tour. This took us to a middle of nowhere wedding hall in Worchester, Massachusetts, with other Arab Americans in a nostalgic mood. We did the same for Ragheb Alameh, the Lebanese competition to Amr Diab. Ragheb Alameh also has a rather hip way of singing. He doesn't equal Amr Diab in charm, he lacks that twinkle in the eye and the dimple in the cheek that make Diab a pop star. We saw Ragheb Alameh at Starbucks in Beyrouth, twice in a row. He sits there, remembering his tours across America and the weddings that paid him thousands to perform. A decade has passed and those two stars of the nineties have been replaced by botox loaded divas like Nancy Ajam and Haifa Wahbe. I don't follow those trends but have caught up on another one, which suits my musical disposition more. Yasmine Hamdan is Lebanese and like me, she has a penchant for Afghans. I have Mirwais, a son, named after the DJ and she has the DJ Mirwais as her collaborator. Together they have created a techno infused Arabic record, Arabology, that hasn't been acclaimed as it should have been! Incidentally I have seen the latest Elie Suleiman film in which her music can be heard. It was an autobiographical film about growing up as an Israeli Arab. Simply put in beautiful cinematography. With those pictures of the Time that remains in mind, the Amr Diab song did resonate today! As a child, the only homework I remember doing was the homework I did with a parent. I didn't bother doing any homework alone. So I would go back to school and tell the teacher the dog ate the homework and when they realized I never had a dog, I came up with a flurry of other excuses. The most truthful excuse would be that I had forgotten the book at school, or the homework at home, or forgotten it was for that day, or forgotten that we had any homework at all. I was a scatter brain and a day dreamer. Till this day, I remember my parents teaching me. My mother was the main tutor. She listened to memorized lessons and assisted me with the memorization. She was very good with poetry and theater and she advised me to put the tone and I always made it to theater auditions, gaining the coveted roles in school plays. She sat with a pink multiplication tables and reviewed my tables constantly. She made me recite all my conjugaisons. She was a busy mother with three other children so she didn't have the time to assist me with the exercises, or the essay writings, all the applied learning. However she sat patiently and gave me the dictation or listened to me read the essays out loud. Today, I sometimes read my blog writings out loud to her. I was in the French system and her French was good to a certain extent so she often found me tutors, especially in the subjects I liked least: sciences. Those tutorials only confirmed my further dislike for sciences. The only science I excelled in was mathematics. My favorite tutor was my father. My father, especially in those days, had a thin knowledge of French. I would always explain the instructions for the mathematical exercise and we would then get started. Mathematics is a universal language. However, my father's French got stronger with each and every "probleme" (problem solving exercise). He still claims that "problem solving" is part of the French cultural psyche. In France, people often turn to that educational experience to begin their day. 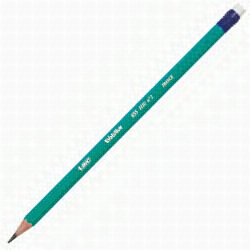 The first thing my father did when we studied mathematics was to clear the desk, to have draft paper ready, to have a ruler, an eraser and most important: a sharp pencil. He would then tell me to take it easy, he taught me not to fret in front of mathematical axioms or geometrical instructions. One step at a time was his motto. Mathematics is an exact science he still says. It is either right or wrong. A unique solution. Perhaps I like mathematics because I associate it with paternal attention. Evidently his methodology worked. I excelled in the subject and when I prepared for my baccalaureate exam in mathematics, I requested the assistance of a math tutor other than my father who had possibly forgotten that high level of mathematics. I wanted to maximize my grade in a subject I was very good at. Indeed that is another thing I learned while studying mathematics: if you are good in a subject, focus your attention on that subject because you can progress much more than you ever could in a subject that you are bad at (like physics in my case). When in lack of inspiration, I read the obituaries in Le Monde. They lie under the rubric of Disparitions (Disappearing) and are always about famous people or successful ones. In the summer I discovered the 1988 Nobel Prize of Literature winner Jose Saramago, writer of Blindness, and I ran to the bookshop to buy a book that had been published years prior. I looked at the August obituaries column and I found the historian Tony Judt. There is a split second that determines whether I will read the column or not. We tend to read the obituaries of names we recognize. However, I always remind myself that discovering the life of those who have contributed to the intellectual discourse often happens when they pass away. Their career and contributions are then highlighted. The first descriptions of him are general: historian of Europe, English man who lived in New York, taught at Berkeley for a while and was a passionate Francophile. For that reason alone, le Monde conceded three quarters of a page to his life and writings. I learned that he had served in the Israeli army in 1967. Soon after, disillusioned, he went back to university to study European studies and towards Israel, he became very critical. I became intrigued by this reputed intellectual. Despite the fact that he was a professor/historian, he became engaged politically and was ready to speak his mind on other issues than his specialization. However, his credibility as a scholar gave him the plate form to voice his remorse, something others would call "self hatred". I don't readily accept such labeling, despite the fact that it catches my attention. Isn't Fouad Ajami called a self hating Arab? That certainly doesn't make him less of an intellectual and a scholar! I googled Tony Judt and found an exquisite paragraph that I must quote here. In all evidence, I enjoyed reading it because it expressed my very personal beliefs. However, he had to write it with that certain logical mind set, with the confidence of a scholar who can make statements and with the ability to express so much in so few words. "The problem with Israel, in short, is not—as is sometimes suggested—that it is a European “enclave” in the Arab world; but rather that it arrived too late. It has imported a characteristically late-nineteenth-century separatist project into a world that has moved on, a world of individual rights, open frontiers, and international law. The very idea of a “Jewish state”—a state in which Jews and the Jewish religion have exclusive privileges from which non-Jewish citizens are forever excluded—is rooted in another time and place. Israel, in short, is an anachronism." It is his precise vocabulary, his simple quasi journalistic vocabulary that attracted me. Beyond the subject matter which I hold at heart. I googled him further and found his last articles on the summer Gaza flotilla. I read about his opposition to war against Iraq. 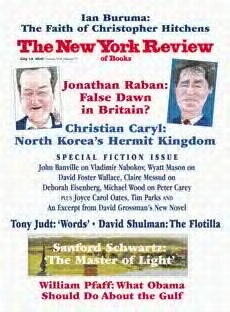 I also read his many articles in the New York Book Review where he wrote frequently. He has an essay which is entitled "Words". I am convinced that he had been influenced by Marcel Pagnol, as Tony Judt mastered the French language. Like the French author of La Gloire de Mon Pere, he celebrates the preciousness of words, both writers capturing words like butterflies and collecting them. As I read Judt, I could sense his reverence to these cherished words. I would read his paragraphs aloud just to hear the composition of his sentences. I was glad I had not skipped the obituary page on that day and regretted that I had not noticed Tony Judt while he was alive. My sister teased me for a full summer. She said I would call my daughter Opaline one day. I had a one year old son then and had left him for the first time with my parents to travel. My husband, sister, older brother and I met in Damascus for a week. During that trip, I was obsessed with the idea of finding some "opaline". Opaline is a French sounding noun for a certain glass that was used for glasses and wine carafes in Safavid Iran. How these antiques, produced in France for a Persian market, ended up in Syria is a mystery. With the help of my close friend, we found them, I bargained adamantly and walked out with a white one and a pistachio colored one. 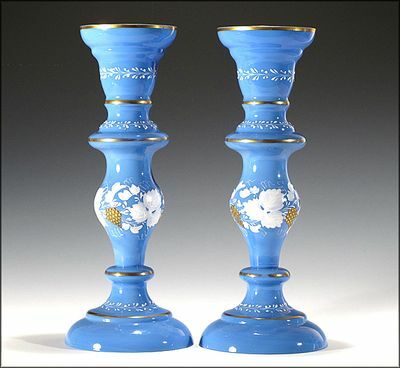 How extraordinary, the global trade of antiques, anticipating the globalization! Another antique that I particularly love is the "Morghi" porcelain plates and bowls. My mother collects them and so did my paternal great aunt, who was Lebanese. They are called Morghi because these early twentieth century made in China porcelains always have a chicken or two painted in the green background. I hunted for Morghi in the Isfahan bazaar with my older brother and got a few pieces but it was in Geneva, in a carpet store that we discovered a treasure for a bargain. It was a very large Morghi bowl with a stamp, identifying it as a "zil it sultan", part of the dinnerware of the Sultan of Iran. The Swiss vendor didn't recognize its value and we bought it in a split second. How a porcelain made in China for the Persian king ended up in Geneva fascinates me! My mother is my example. She has always understood the value and beauty of antiques. She has a rich collection of morghis, opalines and "zir khaki", pre-Islamic archaeological antiquities. I have grown surrounded by these treasures and only own debris in comparison to her. I haven't seen my twin cousin (we were born two weeks apart) in four years. We made up for it in five hours, when he kidnapped me in Beyrouth, took me out to lunch ,gave me a tour of the city and of course caffeinated me. He teased me a lot. But he also gave in by dropping my husband and I at an art gallery. Then he turned to me and asked : "Do you need to go to the bookstore?" He hadn't forgotten my love for books! I was touched by that detail. I must not walk into a bookstore with a caffeine rush. No wonder Borders and Starbucks collaborate! This morning, as I was sipping my grande skinny cappuccino, I remembered my daughter's schoolbooks had arrived and I rushed to pick them up, a warm paper cup of coffee in hand. The smell of the paper, the color of the book covers. I felt at home at the pretty French bookstore near our school. I tied my hands behind my back and resisted searching for more books to grace my night stand. I already have so many piling up to be read, many of which I purchased this summer because I know the imported French books in Dubai are much more costly. So I walked in, coffee in hand, and marched right up to the comics section. This is what my ten year old son resorts to now that I have forbidden him to watch DVDs and TV. In my opinion, comics aren't so bad. They have covers and a binding and actual text. They fit the description of books, even though I would much prefer he read entire paragraphs that are not entirely in direct speech. He has already finished the entire manga collection of Naruto. He awaits the upcoming volumes every trimester. He has now ventured into Alix, a Roman hero living the Roman, but by extension also the Greek and Ancient Egyptian experiences. He has always been a fan of that historical period and thoroughly enjoys battle stories and legends of legionnaires. I found six volumes and bought him all six. That will provide me with interesting prizes for good behavior and/ or good grades. I also snuck in an adaptation of Le Petit Prince in comics. When he rereads it for class, he can always take the short cut to really understand the classic. I really should never walk into a bookshop while drinking coffee! I didn't think I would make it this far! Instead, I imagined my inspiration escaping me. How many more details can I mention? Blog writing has been effortless for me. It probably requires more energy and time for the readers to log on and sometimes comment. It surely takes a lot of dedication for my sister to edit me, for my father and older brother to comment on 95% of the blogs and for my husband to post me even when he is in Kabul! I sometimes wonder, like any one with a production (however meager mine may be) about the topics chosen, the frequency of some topics, the way I approach a souvenir, a book or a movie, the way I portray people and movements and events. I want my blog to reflect a certain stream of consciousness as I never force myself to write about something, nor do I force inspiration. Ideas pop out and I jot them on the blackberry. My current identity has certainly changed with this new activity. I can now add an asterix to busy mother and append: I am also a blogger. In today's day and age, people blog like they jog. I am still proud to be a regular blogger as I compose daily, some pieces longer than others. 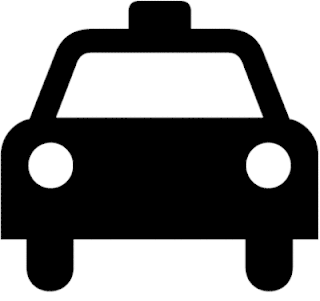 My site is not technologically advanced and I cannot tell how many readers log on. However, nothing is more rewarding than receiving a written comment, even when it is small, because it is an indication of readership. Amusing are the times I receive personal emails or blackberry chats about the blog of the day.The funnest time in all this blogging activity are the conversations that surround it. My friends and relatives tell me they read me, they make their comments, state their opinions and I get encouraged. I always ask them to point out a posting they like most or remember reading, or one that amused them. It is because I wonder about my own preferred compositions. I often write short anecdotes to get my point across. Many times I deal with academia: my own or my children's. I always find it necessary to allude to an art work, even when writing about yoga, feminism or hunting. Most pleasurable for me is to mix a cocktail of subjects into one, because of the freedom to write "the way I think". The mental stimulation gives me the energy to write. Writing is conducive to more writing. It comes with practice. Like practicing a sport or a musical instrument. Yet I always question: will I be inspired to write tomorrow? If I were an engineer, I would build a bridge. I wish I had studied engineering just to build a bridge. Why were physics classes so difficult? I have never crossed a bridge without noticing it. That last sentence can be read both literally and metaphorically. Indeed, bridges have become symbols for communication, union or facility of movement, even a hand stretched out. It also stands for a crossing, overcoming an obstable. I talk to my kids about the bridges of life, but since they are still young, I especially point to those real bridges around us, each and every time we cross them. I have visited the infamous London Bridge and the Pont d'Avignon. 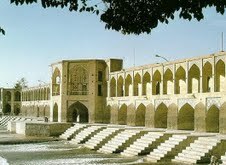 I have compared the classic Ponte Vecchio of Florence to its Eastern counterpart in Isfahan. With my son, I have recited the poem "Sur le Pont Mirabeau", on a random bridge in Paris because we didn't find verlaine's favorite bridge. We did cross the Pont Neuf (which is ironically the oldest bridge in Paris) and I explained that it had once been wrapped by Christo. In San Francisco, when we approach the infamous red Golden Gate, I always remember the novel in verse by the same name that Vikram Seth composed. This summer while I was dancing the night away at Rina, a nightclub in Istanbul, I remained mesmerized by the illuminated bridges that linked Asia and Europe. A bridge is much more mundane than it appears in the novels by Hemingway, or by Haddad, the Algerian novelist, who wrote about an engineer turned revolutionary, who puts an explosive under a bridge that he'd built himself. I translated that novel, whose title I have forgotten, from French into Arabic, so obsessed was I with the bridge. 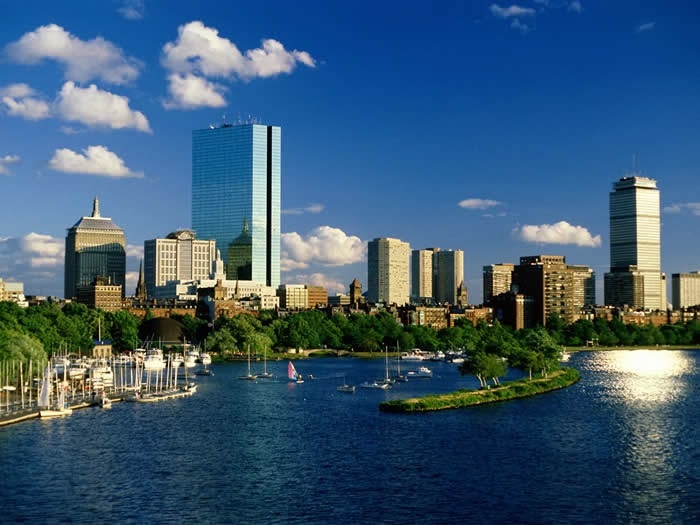 There are also the bridges I have passed over very regularly: the Key Bridge that we see from our apartment in Washington DC, the Salt and Pepper Bridge that crosses the Charles River in my beloved Boston and even the Massachusetts Bridge where I had a car accident! I enjoy driving over the Dubai bridges. Maktoum Bridge has retained her elegance despite its expansion. I always peer over to catch sight of a fleeting dhow. Garhoud bridge, with its 18 lanes, resembles a large whale that has parked her white spine so that we can rush to the airport or to the Aviation Club for fitness. The floating bridge is a fun way to head to the Creek Club where my son always points to the 7th hole and asks: "remember my birdie there Mama?" Business Bay the super-design one, makes for a sprint to Festival City. The bridges of Geneva are the closest to our hearts. On a random summer day, catch us, mother duck with ducklings, on bikes and scooters, crossing, incessantly. We like the footbridge that leads to Rousseau Island where we gaze upon Jean Jacques' statue which stares at gliding swans. We love the Mont Blanc Bridge with its flapping flags. On a clear day, I point to the highest peak in Europe and we remember the magical 3604m high. Always, my youngest recalls the story of "al shirir taht al jisr" (the angry troll under the bridge), who we look for often, but we always encounter clear water instead, perhaps with lurking crocodiles. I can say the word "bridge" in so many languages... a true indication of my fascination! I was first introduced to Afghanistan in a very academic dry setting. None of the books I had read for my class at the Fletcher School even had photographs. I studied the history, stumbled over the politics and eventually understood the ethnic intricacies. It was 1992 and Afghanistan was a distant, war torn, closed society. The international press barely made it "inside". Kabul was a forbidden city. If aid workers and Afghans ventured "inside Afghanistan", it was on the borders. The name Massoud was thus familiar to me from these classes. He was a warlord, and the head of a militia. However, it was an article that appeared circa 1999-2000 that truly introduced him to me. It was the first time I had heard of the author of the article, the famed French philosophist Bernard Henri Levy, also known under his acronym BHL. It was one of those "bombshell" articles in Le Monde that I will always remember. I am glad I got introduced to BHL through his writings of Massoud and vice versa. Massoud brings out the best side of BHL, his humanitarian and cultural relativism philosophy. Massoud is best portrayed with the romanticized words of his friend and admirer. Through BHL's words, I discovered in Massoud, a Che Guevera like figure. I was on a plane, and I remember read the article out loud to my husband. Since it was in French, I had to interpret simultaneously for him, which made me appreciate BHL's style even more. A few months later, at a summer resort in France, a friend pointed out to a man and an actress (his wife Arielle Dombastle) and told me that was BHL! I took my then 2 month old son and presented him to the philosopher: "this boy is Afghan I told him. I must congratulate you on the portrait-article you made of Massoud. You have fueled our dreams." who he prophesied (as philosophers should) that he would be the first black President of the USA. Perhaps Obama mentioned his ambitions, but BHL believed in the aura that he discovered. He published a whole chapter in 2005 about Obama. It was a gamble BHL was willing to take as he backed a man who wasn't even a candidate till 2006. It appears that BHL is a king maker. The very tan French intellectual, probably flattered by my compliments, was charmingly friendly. We spoke about Massoud. It was the summer of 2000. One year before Massoud was assassinated. Massoud's death is one of those happenings you never forget. I was at a gas station in Northern California, buying a soft drink. I remember I cried in disappointment. A symbolic figure had died. Massoud's image has since September 9th, 2001 (2 days before September 11) covered the walls of his country. He has received all the honors from his countrymen, tribesmen and fellow Panshiris. A famous Iranian photographer Reza, who shadowed the political hero, has immortalized his photogenic charisma. Together, Reza and BHL have facilitated the emergence of Massoud as an icon, a historical figure. Chaouki Chamoun and Ayman Baalbaki. Vertical lines are their common outlook. Architecture is what they paint. They are both Lebanese. They are from two different generations. I met Chaouki Chamoun this morning as he pointed to a 1987 abstract painting he had not seen since the collector who purchased it, had hung it in his dining room. He touched his work with his fingers and spoke of it like a long lost relative. 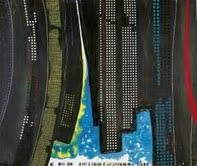 I listened to him talk about collage and white paint and especially the vertical lines. I looked at this earlier work and without being able to decipher it, I was privileged to ask him: is this blue the sea? He indicated that it was the sky. I inquired about his more recent works. His huge white mountains and especially his monumental cityscapes. They look like distorted bar graphs with illuminated windows. Tiny human figures accumulate in front, in order to give the buildings scale. These cities are the cities of the world, the cities of modernity. New York City most probably because he lived there. Perhaps Beyrouth, because he is Lebanese. 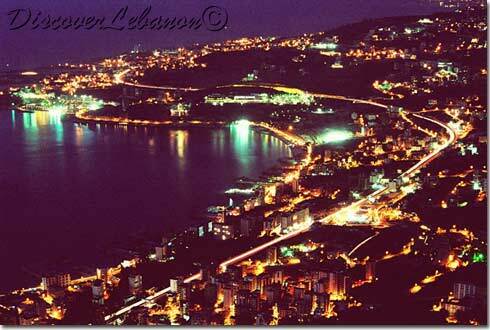 But a Beyrouth of latter day optimism, before the incessant wars. The Beyrouth of the 1960s. Today, I walked the city of my birth and I pointed out various buildings to my husband, the shelled out, delapidated skeletons that remain. "Look", I said "Ayman Baalbaki buildings!" 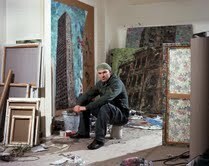 I was alluding to the buildings destroyed by war that Ayman Baalbaki paints. He paints them single on each canvas. Piece unique of a unique crumbling building. Dozens of these canvases, ranging in size, sometimes in diptych format, one canvas hung on top of the other, giving it further verticality. 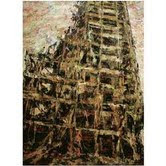 When I discuss these paintings with my friends they say they couldn't live with the sight of a delapidated building. I question that because if they looked around them, in Beyrouth, they would see dozens of those historical buildings, standing proofs of a past that was real, not an imagined nightmare. Perhaps also, a reminder for all Lebanese of the consequences of war. I also tell them that the painter that has created them has painted them on fabric covered in flowers, resembling wallpaper or a tablecloth, and these flowers come through under layers of paint, an indication of the artist's romantic heart, his quasi-organic feel of the city. The harsh realities of these bombed out skeletons, the vestiges of war, are thus painted with a certain nostalgia. Ayman Baalbaki, born in 1975, was a war child. He paints what he knows intimately. As we ended that day with a celebratory dinner, the illuminated bay of Jouniyeh in the background , I gazed upon the 1960s house of the hostess, with its Eames lounge chairs and modern furniture , and imagined a time past, one of nonchalance and dolce vita and successful laissez faire economy. Here were two painters, actually present at the party, Baalbaki the younger and Chamoun, the older, celebrating with a large gathering of designers, art collectors, writers and reporters. The music was hot and the night air was cool. I was dreaming of verticality. Of cityscapes. Of Beyrouth the artistic. Takashi Murakami is being honored this Fall with an exhibit of his work at Versailles, as have Jeff Koons and Xavier Veilhan in the past, and as will Bernar Venet after him. Unlike those who stand in opposition to this "manga" exhibit in the bosom of French Classicism, I believe that Versailles should be honored to receive such a talented contemporary artist. All the men mentioned above are top tier contemporary artists. Two are French and two are foreign. They have decided, for these series of annual exhibitions that last a season, to alternate French and foreign artists, and that is understandable because Versailles is in France and the French government must encourage and celebrate its own talent. to exhibit in such a wonderful environment. I have read Murakami's opening paragraphs to the exhibit. This written introduction, like the art that is exhibited itself, is an expression of his reverence to the historical and artistic symbols of Versailles. Most important, he mentions the enchanting effect of Versailles, the fact that it has inspired so many people and especially artists. For this rare opportunity in his career, he has created works of art that will remain forever, while the exhibition is only temporary. 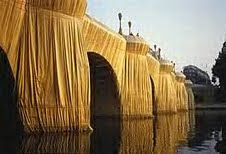 This is what those who oppose this exhibit must keep in mind: this is an artistic event, and like Christo's art isntallations, it is only short lived. Christo always eventually unwraps his buildings and Murakami will pack his Manga statuettes. Versailles will be herself again for three seasons before Venet comes in with his gigantic steel structures in June of 2011. Besides, who doesn't enjoy the justaposition of art against art? A Jeff Koons red pneumatic lobster hanging with the XVIIth century candelabras in the Hall of Mirrors is a perfect example. A Murakami Flower Monster statue staring at the painted ceilings of LeBrun with multitudes of colors and flowers would be fabulous. However, the negative press that these art events received lead to a concession: no future artists would be able to exhibit in the palace, only in the gardens. I would have dreamed to see Bernar Venet's Indefinite Arcs in the Salon of the "Roi Soleil"! The honors will be limited to the gardens of LeNotre. Have they forgotten that an older palace, Le Louvre has become a museum exhibiting art from prehistoric time till today? Have they forgotten that Francois Mitterand commissioned a Chinese-American architect, I.M.Pei, to build glass pyramids, anachronistic to the building in material and in shape? These same pyramids have inspired architecture worldwide: there are glass pyramids everywhere! The opposition accuses Murakami of having "put lipstick on the Mona Lisa". What is wrong with that? Andy Warhol has painted her in sepia and multiplied her unique portrait. For the French who blame Warhol, their own Fernand Leger has miniaturized the Mona Lisa to a passport picture format and added keys to the painting. That is not a caricature. It is a way of appropriating Mona Lisa. Warhol and Leger are big enough to do that. 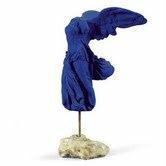 Hasn't Yves Klein, their favorite XXth century artist taken the Victory of Samothrace and painted it acid blue because it is HIS color? The Louvre, the Mona Lisa, the Victory of Samothrace and Versailles will survive the interference of other artists. The heritage of France is not endangered by the approach of other artists, those that will appropriate it by painting it differently, or by adding a stunning addition to it, wrapping it, or exhibiting their art in contrast to it. In fact the French patrimony will be examined longer, appreciated more, valued. "Mettre en valeur" is a French expression that would get lost in translation. 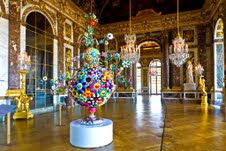 It is the perfect one to explain the effect Murakami's works have on Versailles. "For a Japanese like me, the Château de Versailles is one of the greatest symbols of Western history. It is the emblem of an ambition for elegance, sophistication and art that most of us can only dream of. Of course, we are aware that the spark that set fire to the powder of the Revolution came directly from the centre of the building. completely separate and unreal world. That is what I have tried to depict in this exhibition."